In Mali, the eighth largest country in Africa, women farmers are reaping the benefits of fonio (Digitaria exilis) millet. Farafena, an African-Canadian company, purchases fonio grain and flour from 850 women in Tiebe village in Sikasso region and exports to North America. Traditionally, women thresh fonio by pounding it with sticks on a hard ground. This would take two women an hour to dehul 6 kg of the grain, but now appropriate technologies for processing has helped boost fonio’s status. Oumar Barou Togola, the company’s founder, tells Down To Earth that women can now dehul 150 kg of the grain in an hour using dehullers. 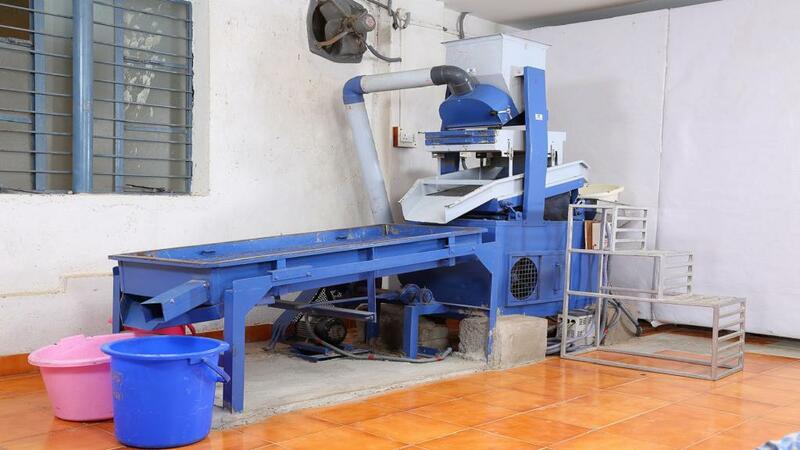 These machines help remove effectivey the sand-sized grain from the husk to produce hulled fonio or paddy fonio. Diesel-powered dehuller designed in West Africa is a great value addition. Then there is also the rotating drum which removes dust and small particles from fonio and an air separator that helps remove any chaff or large stones. Women then wash the fonio and spread it out on a cloth to dry. The gluten-free grain that grows in Africa’s impoverished Sahel region has now been hailed as a health food in New York, reports the Reuters. Farafena plans to introduce a technology to automatically wash fonio through a process of water column separation and screening. “At present we do not have a retail supply chain in Mali. In future, it is our plan to do co-packing in Mali and invest in supply channels in Africa,” says Togola. Compared to the attention fonio is getting, sikiya ((Digitaria Sanguinalis), another millet of the digitria family, is languishing. Despite its glorious past, sikiya does not feature in the list of millets that the Centre is trying to revive. This year India is celebrating National Year of Millets. In spite of the fact that millets are water efficient and climate resilient, their acreage has declined significantly in India from 36 million hectares (ha) in 1965-66 to 14 million ha in 2016-17. C Konda Reddy, assistant FAO representative, blames changes in consumption pattern, lower yields and less demand for this. However, several millets have survived, thanks to cultural associations and festivals. Krishna Prasad, the founder of Bengaluru-based non-profit Sahaja Samrudha, says that efforts have to be made to design suitable processing machines for sikiya as processing it is difficult due to the hard outer cover of the seeds. According to Stephen Gangmei, in-charge of North East Network’s millets project in Nagaland, there is only one millet processing machine at the NEN office at Chizami village in Nagaland’s Phek district where women come to dehusk. “We do not have machines to make millet powder. People can make powder at home in small amounts for family consumption as grinding takes a lot of energy,” says Gangmei. He adds that the need of the hour is for the government to procure advanced machines. But things are looking ahead. As part of the Odisha Millet Mission, the state government is procuring dehullers and cleaners from December this year for 55 blocks, says Sanjay Pani, the nodal officer of the Odisha Millet Mission. The allocation for buying machines for this year stands at Rs 7 to 8 crore. Ragi procurement will also start at Rs 2,897 per quintal. We will supply ragi under the Public Distribution Scheme from January and Integrated Child Development Services from February or March 2019, says Pani. Not all millets, however, need sophisticated machines, especially major millets like jowar, bajra and ragi, says B Dayakar Rao, principal scientist at the Indian Institute of Millets Research (IIMR). “There is at least some machinery available now. When we started 10 years ago, there was no machinery at all,” says Rao. On December 19, IIMR is coming up with a consortium of premier institutes like the IITs to discuss how to fast track design and procurement of machines, he adds. Dwiji Guru, a Bengaluru-based millet expert, cites two valid points. One is that the existing technology is not being used to its maximum potential because of the lack of investment, and the second is that we are not giving enough attention to skilled workforce. All the current millet missions have this severe drawback, Guru says.